‘Tis the season! The most wonderful time of the year is upon us, whether you’d like to associate that with the holidays or the hot stove. This time of year wouldn’t be complete, of course, without the annual chaos of Black Friday. While millions of Americans scramble to make the most of their money and take advantage of great deals this weekend, MLB front offices will likely be doing the same on the free agent market. With that, let’s take a look at some cost-effective free agents who should most definitely be on the Yankees’ radar. I grouped these players because they serve the same purpose: a left-handed power bat to provide stability at first base. Luke Voit, the likely starter, will have to prove his fairytale 2018 was not a fluke, and Greg Bird is coming off of a second consecutive lost season. The Yanks were heavily linked to Bour at the 2017 trade deadline but could not come to an agreement with the Loria-led Marlins, his former team. Bour is now just one year removed from 25 home runs and a .902 OPS, and will in all likelihood be non-tendered by Philadelphia as they look to move Rhys Hoskins back to first. Adams found a surprisingly tepid market last winter following a career resurgence in Atlanta, settling for a one-year deal with Washington before heading back to St. Louis in August. While he doesn’t look like a bonafide starter anymore, he’s hit no less than 15 home runs in each of his full seasons in the majors and could make an excellent platoon partner to the righty-swinging Voit. 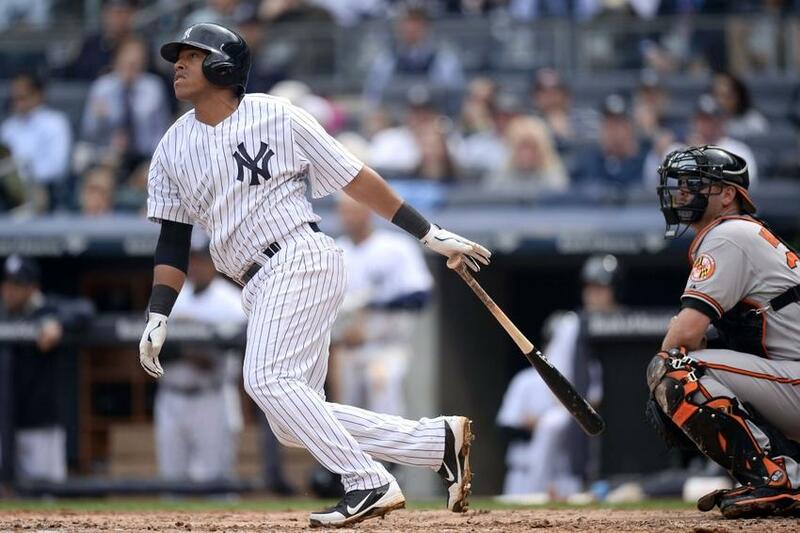 Don’t bet on either man commanding anything more than a one-year deal with the multitude of available first base options, and the buy-low investment could be one well worth it for Brian Cashman with the duo’s tailor made Yankee Stadium swings. This name should come as one familiar to some of the memorious fans. The former NYY farmhand made his debut with the club in 2014 prior to being swapped to San Diego for Chase Headley. The 31-year-old played all four infield positions in 2018, and versatility could be an important find for the Bombers in the wake of Didi Gregorius’ injury. We saw Adeiny Hechavarria and his defense prove to be extremely valuable during his brief stay in New York, and Solarte could take on a similar role but represent more attractive production with the bat. The ex-Padre was a .286 hitter as recently as 2016 and has been a positive WAR player in every season but this past, so a rebound 2019 isn’t at all hard to see. Solarte would need to be acquired by trade, as he is still under the Blue Jays' team control, however, the asking price shouldn't be much considering he would be a rental and is coming off a down year. If Marwin Gonzalez or Manny Machado’s demands become too much to warrant, a reunion with the Venezuelan infielder should immediately become of interest to Brian Cashman and the Yankees. What better way to wrap up this list than with our good friend Adam Warren? The Yanks could have some shoring up to do in the bullpen this winter with the potential departures of David Robertson and Zach Britton, and Warren’s return would represent a return of some of that stability. Even having been traded from New York on two occasions, Warren has been one of the most overlooked, undervalued pieces of the Yankee teams of the past half-decade. In parts of seven seasons in the Bronx, he has posted a welcomed 3.18 ERA over 207 innings of work, most of which coming from out of the pen. Over a full season of work, his 2.70 ERA in 30 innings with the team would have ranked tied for third amongst all Yankee relievers, trailing only Chad Green and Aroldis Chapman. The 30-year-old will easily come cheaper than the market’s premier relievers, say for example Adam Ottavino, someone the Yankees have been reported to have interest in. Aaron Boone is going to need reliable innings this coming season, and there’s no harm in bringing back someone who has proven time and time again he can provide them.